I love blogging about all the great deals and coupons for all of you, but I have to admit, sometimes the lure of the computer gets in the way of the other things I need to do around the house. I'm pretty good about doing the laundry, feeding my family, and doing the shopping and the dishes. Cleaning, not so much. The kitchen gets cleaned fairly regularly, and so does my children's bathroom, which doubles as our guest bath, as there are only two bathrooms total in the house. The master bathroom is another story. Since my husband and I are the only ones who use it, it's so easy to say, "Eh, I'll just clean it another day." And one day becomes two, and three, and pretty soon it's a total mess. According to the folks at Soft Scrub, the new Soft Scrub is tough on stains, yet gentle on surfaces. The new and improved formula has more whitening power and less residue for better rinsing. That means better cleaning and faster rinsing for your tile, grout, and tubs. And I have to say, it did a good job. Sorry, no before and after pictures - the bathroom was way too messy to take a before shot. But the Soft Scrub lemon cleanser cleaned up the messy countertop with just a little bit of elbow grease. It didn't leave that gritty feeling on the surface that I had often gotten from Soft Scrub products in the past. I hated that feeling, but it wasn't there with this product. It cleaned up the toilet well as well, leaving it nice and white and with a slight lemon scent. I also liked the new bottle design. The all-purpose cleanser didn't clog up the top of the bottle like I've often seen other products do. It poured nice and easy - maybe a little too easy. I did find that a little of the Soft Scrub Total goes a long way. Don't use too much, or it will be hard to clean up! But that is good, because you use less and thus won't have to buy it as often, saving you money. Speaking of money, Soft Scrub is hosting a sweepstakes along with the release of the new Soft Scrub Total All Purpose Bath and Kitchen Cleanser. 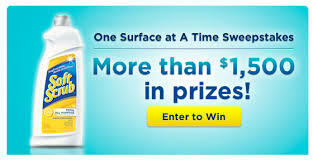 One grand prize winner will receive $1000 and a 1-year supply of Soft Scrub coupons, while 250 additional winners will receive one Soft Scrub coupon. Click here to enter the sweepstakes! Would you like to try the new Soft Scrub Total All Purpose Bath and Kitchen Cleanser? Look for it at your local supermarket, national chain store, or drug store. Become a fan of the Soft Scrub Facebook page to learn more! Frugal Follies is hosting a giveaway for a Soft Scrub Total All Purpose Bath and Kitchen Cleanser free product coupon! Three winners will be chosen. Here's the fine print on the coupon: Get one free valid on any Soft Scrub product. Limit one coupon of specified item(s). Coupon not valid with other coupons for the same item. No cash back if coupon value exceeds retail price. Maximum value $3.39. Expires 12/31/13. To enter the giveaway, use the Rafflecopter below! The giveaway is open to US residents 18 and older. The giveaway ends on Thursday, March 21, 2013, at 11:59 pm EST. If you are one of the winners, Frugal Follies will contact you via the Rafflecopter email you have provided. If you do not respond within 48 hours, you will be ruled ineligible to win the prize, and another winner will be chosen. This promotion is in no way sponsored, endorsed or administered by, or associated with, Facebook. I'm going to tame the "ring around the tub" with it! The stove top cooking spills--the worst! I would use it to clean my kitchen and my bathroom. I would clean the tub with it. I would clean my tub and shower. I need something gentler than ajax but stronger than just a spray for my countertops. my bathroom and my kitchen counter! I'll use it to clean my bathroom sink! I clean the dog prints off my door, and food spills off the counter. i will use it on my nasty bathroom and kitchen sink! I would clean my bathroom with it. Sticky, stubborn soap residue in my shower. I will use it on the bathtub and the tile in the shower. My counter tops.. takes all the old scum on it and makes them brighter. I will use it to clean the shower !